How cold has it been in New England recently? 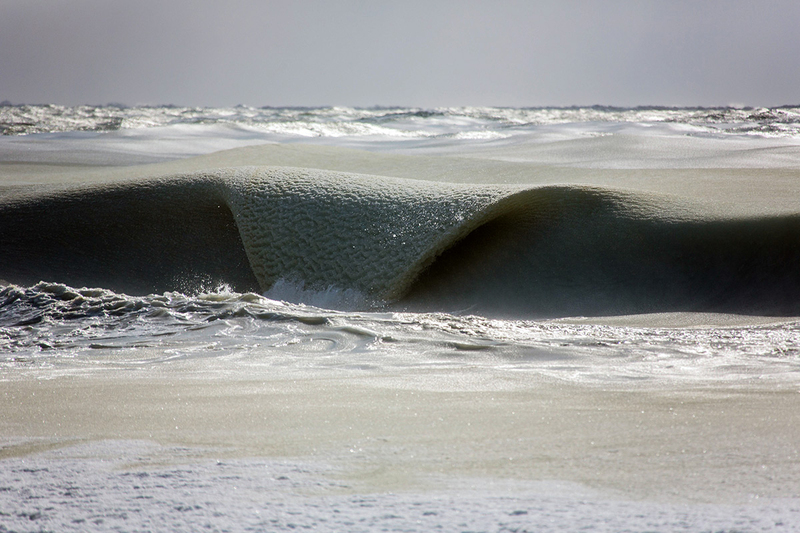 Cold enough for ocean waves to partially freeze along the coast of Nantucket Island in Massachusetts. Photographer Jonathan Nimerfroh captured these unusual slushy waves on February 20th, when the local air temperature reached a high of only 19°F. While freshwater freezes at 32°F, seawater – owing to its salt content – has a lower freezing point of 28.4°F. To see more images of this uncommon wintry phenomenon, visit the photographer’s website. After getting off to a relatively slow start, winter has kicked into high gear. For the second time in less than a week, a massive arctic outbreak has sent most of the eastern U.S. into a deep freeze. From Michigan to Florida, many communities are dealing with record cold conditions. Here in New York City, the temperature dropped to 2°F in Central Park early Friday morning – a new record low for the date. The previous record of 7°F was set in 1950. Factoring in the wind-chill, it felt like -15°F. Our normal low temperature for this time of year is 30°F. 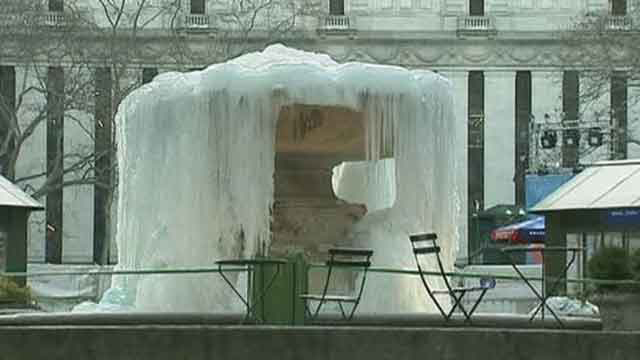 As cold as it was on Friday, it was not the coldest day the Big Apple has ever experienced. That dubious honor, according to the NWS, belongs to February 9, 1934, when the air temperature reached a brutal low of -15°F. This current arctic invasion is being dubbed “The Siberian Express”, as its bitterly cold air originated in Siberia in northern Russia. As it retreats later this weekend, temperatures are expected to moderate a bit before another cold shot heads our way. Remember, these types of frigid conditions can be life-threatening. Stay warm! Last year, 2014, was the hottest year ever recorded on this planet. January 2015 continued the trend, ranking as the second-warmest January on record. 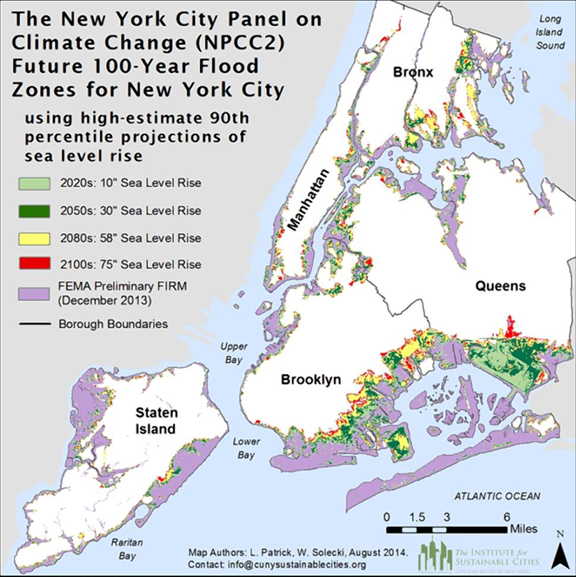 According to a report released by NOAA’s National Climatic Data Center, Earth’s combined average temperature for the month – over both land and sea surfaces – was 54.99°F. That is 1.39°F above the 20th century average. The warmest January on record occurred in 2007, when the temperature was 1.55°F above the long-term norm. While heat dominated most of the planet last month, some places were particularly warm. China had its warmest January on record since 1961. In the contiguous US, seven western states – California, Idaho, Nevada, Oregon, Utah, Washington, and Wyoming – each experienced a January rated in their top ten warmest. Global climate records go back to 1880. 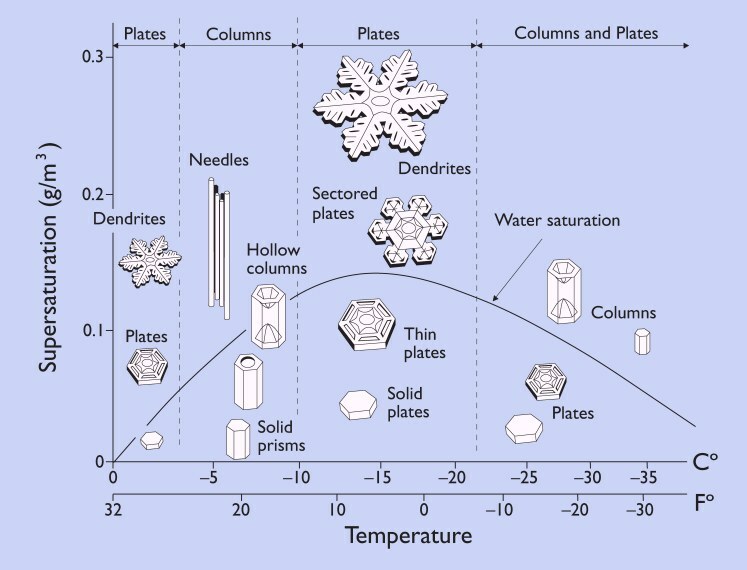 There is an old saying: “no two snowflakes are alike.” While that may well be true, their basic shapes are driven by temperature and atmospheric moisture content. Here is a look at their general categories. Another arctic outbreak has sent a large part of the US into a deep freeze. Across the East, temperatures tumbled this weekend with some places experiencing the coldest conditions they have seen in decades. Here in New York City, the mercury fell to just 3°F in Central Park early Monday morning. That is the coldest temperature the city has seen in 11 years, but not quite a record. According to the NWS, the record low for the date was set in 1888 when the temperature was only 1°F. Our normal low for this time of year is 29°F. Produced by a deep dip in the jet stream, our current frigid conditions will be staying in place for a while. In fact, a reinforcing shot of bitterly cold arctic air is expected to arrive in the region later this week. These types of temperatures can be life threatening, so remember to bundle up! Icicles are a classic symbol of cold winter weather. In order to form, however, they need a mix of both warm and cold conditions. These hanging pieces of tapered ice develop when the air temperature is below freezing, but there is enough heat from the sun – or in the case of a building, a poorly insulated roof – to thaw some snow. As the melt water runs off the edge of a surface, it re-freezes in the cold air. Starting with only a few water droplets, an icicle can begin to form. Over time, as melt water continues to drip and re-freeze, an icicle gains both layers of thickness and length. Often seen forming along the edge of roofs, icicles can also be found on tree branches, power lines, and rocks where water seeps out of the ground. The size and shape of an icicle, according to experts at the National Snow and Ice Data Center, depends on a few different factors. These include the shape of the surface on which it forms and the number of different directions from which melt water approaches the growing icicle. 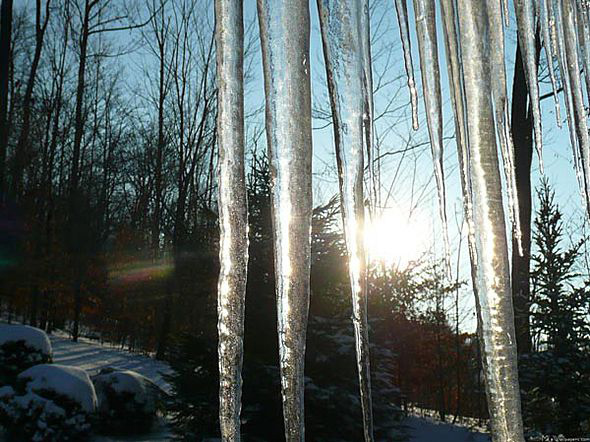 Icicles can range in size from a few inches to tens of feet. We are only half way through winter and it seems some people have already had enough. 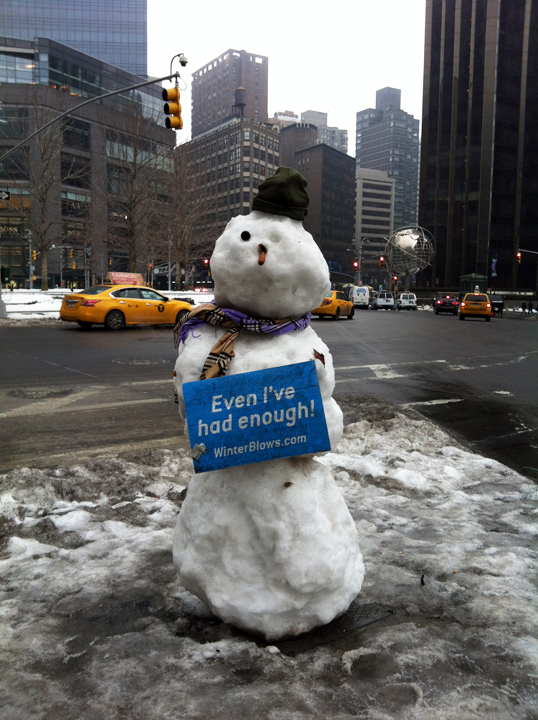 I spotted this message-bearing, battered snow-person in Columbus Circle today as the Big Apple gears up for yet another round of wintry precipitation. Today is National Weatherperson’s Day in the United States. While not an official federal holiday, it is a day to recognize the work of all individuals involved in the field of meteorology – not just prognosticating groundhogs. According to the NWS, February 5, 1744 was the birthday of Dr. John Jeffries – one of America’s first weather observers. As a Boston based physician with a deep interest in weather, he kept detailed records of daily weather conditions from 1774 to 1816. He also took the first known weather observation from a hot air balloon in 1784. Recognizing the significant contributions Dr. Jeffries made to the science of weather, this date was chosen in his honor. Technology has grown by leaps and bounds since the 18th century, but the core work of meteorologists has not changed. They continue to gather and analyze weather data to provide forecasts and warnings to the public in an effort to protect lives and property across the country. 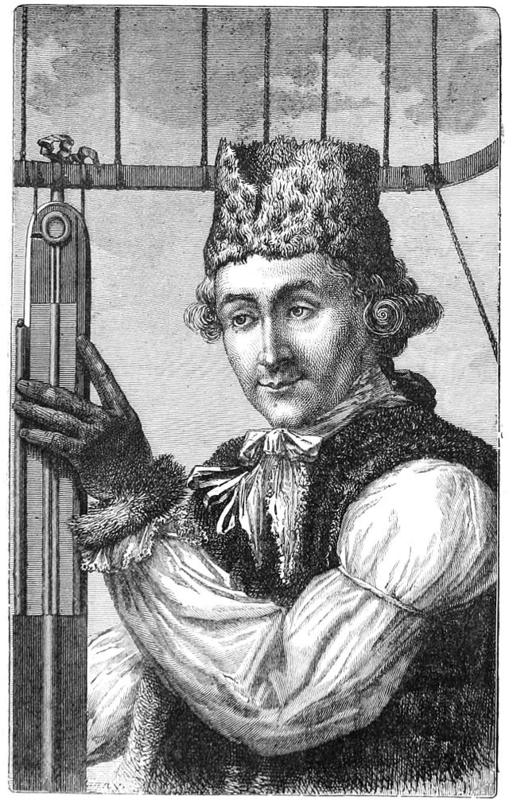 Dr. John Jeffries taking weather measurements from a hot air balloon in 1784. Source: Wonderful Balloon Ascents. Today is Groundhog Day, the midpoint of the winter season. On this day, according to legend, the weather conditions for the second half of winter can be predicted by the behavior of a prognosticating groundhog. If the groundhog sees its shadow after emerging from its burrow, there will be six more weeks of winter. If it does not see its shadow, then spring will arrive early. The practice of using animal behavior to predict future weather conditions goes back to ancient times. The particular custom that we are familiar with in the United States grew out of the old world tradition of Candlemas brought by German settlers to Pennsylvania in the 1880s. Today, many communities across the U.S. and Canada continue this age-old ritual with their own special groundhogs. The most famous of these furry forecasters is Punxsutawney Phil from Pennsylvania – he was portrayed in the 1993 film, “Groundhog Day”. This year, despite an overcast sky, Phil saw his shadow and is calling for six more weeks of wintry conditions. In New York City, our local weather-groundhog is Charles G. Hogg – more popularly known as “Staten Island Chuck”. Coming out of his burrow this morning, he did not see his shadow and is predicting an early spring for the Big Apple. Long-range forecasts are a tricky business, so a difference of opinion is not that uncommon. Either way, the spring equinox is 46 days away.